Arthur Johnson, former vice chairman of the board of trustees, was named acting president Wednesday. Art Johnson, vice chairman of Lindenwood’s board of trustees, has been named acting president of the university, according to an email sent out to faculty members Wednesday afternoon. The email, sent out by Annie Alameda, the president of the Lindenwood faculty council, said the announcement was made at a meeting Wednesday morning with faculty council officers, staff council officers, administrators and two members of the university’s board of trustees. 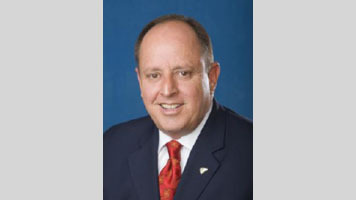 According to Lindenwood’s website, Johnson retired from the American Automobile Association in 2013. He worked for AAA for 28 years and served as president and CEO for seven years. Johnson is currently a member of the Board of Police Commissioners for the St. Louis County Police Department. Johnson also has served as executive vice president at KSJ Advertising and has worked in advertising, public relations and marketing. He and his wife, Susie Johnson, were honored for their volunteer work with Youth in Need in 2011. The email from Alameda confirmed that President Michael Shonrock was put on paid administrative leave by the board’s executive officers Tuesday morning. “This is a personnel matter and no additional information was shared,” the email said. Alameda’s email said board chairman J. Michael Conoyer and Johnson reassured those at the meeting they were dedicated to maintaining the stability of Lindenwood St. Charles and Belleville campuses. The board is set to meet Friday at 12:30 p.m. in the J. Scheidegger Center. Did Mr. Johnson resign his position on the board of trustees prior to accepting the acting university role? The article doesn’t say – if he didn’t, wouldn’t that be a conflict of interest?